These printable sudoku puzzles range from easy to hard, including completely evil puzzles that will have you really sweating for a solution (They're solvable, I promise.) 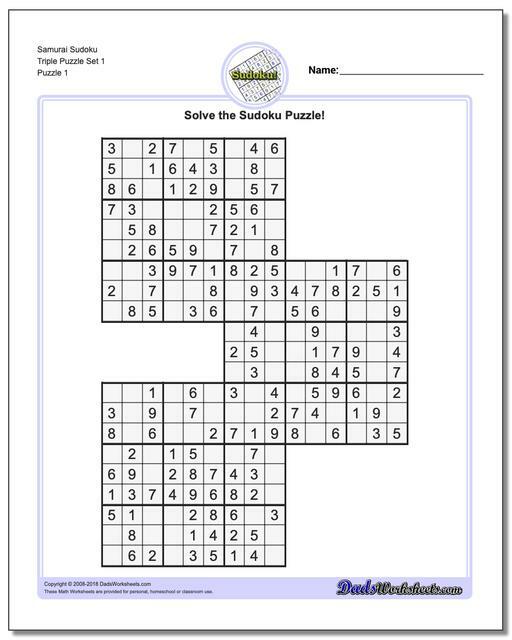 In addition, you'll find color sudoku for kids that serve as a transition for grade school students into the easy sudoku and beyond. Whether you are young or old, sudoku helps build critical thinking skills and is a powerful way to extend your math abilities... 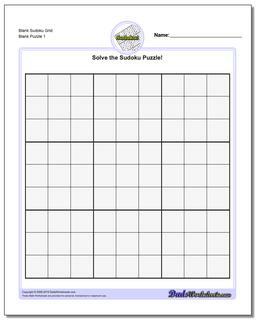 Try these puzzles out and let me know what you think, Sudoku Master! When learning sudoku, "easy" in the puzzle description is definitely a welcome word. 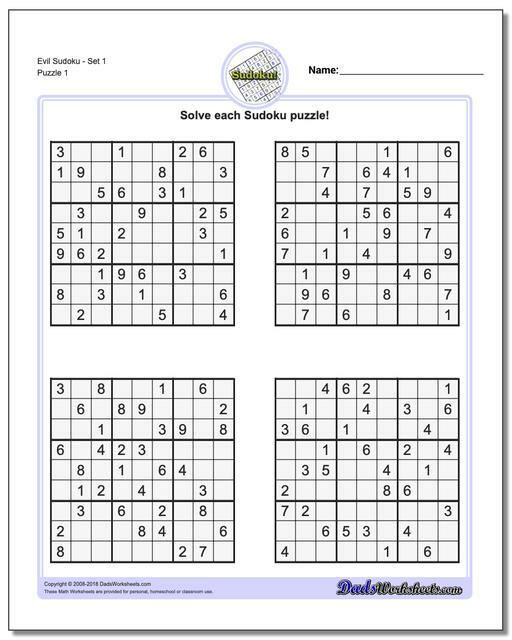 These printable sudoku puzzles are very easy to solve using only basic strategies, making them great sudokus for kids. 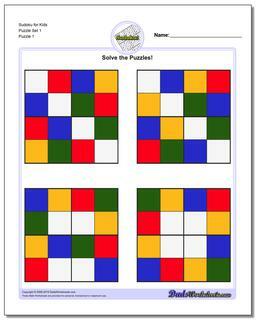 Answers are provided on the second page of each puzzle PDF. These medium difficulty sudoku puzzles are a great followup to the easier puzzles in the previous section, and they will have you ready for harder sudoku in no time! These hard sudoku puzzles have much fewer initial clues and will give your sudoku strategies a real workout. Recent research has shown that that a valid sudoku puzzle will have at least 17 clues. The evil sudoku puzzles in this section come from Gordon Royle's list of minimal sudoku starting geometries with these challenging starting conditions. Ready for mega extreme sudoku madness? 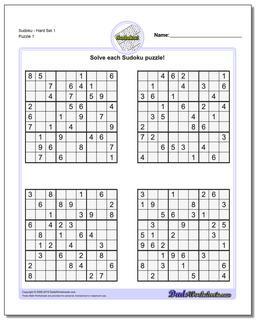 Print these super Samuari sudoku with five conjoined puzzles and you will be busy much longer than you expect. 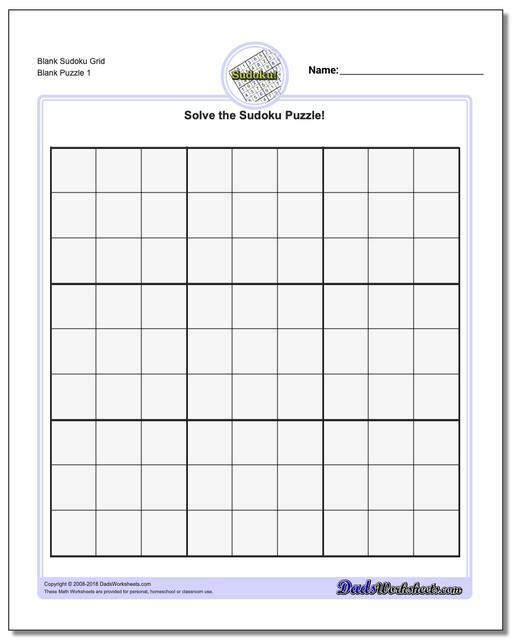 Sudoku can help kids learn critical thinking and logic skills, but the standard puzzles can be a difficult place to start. 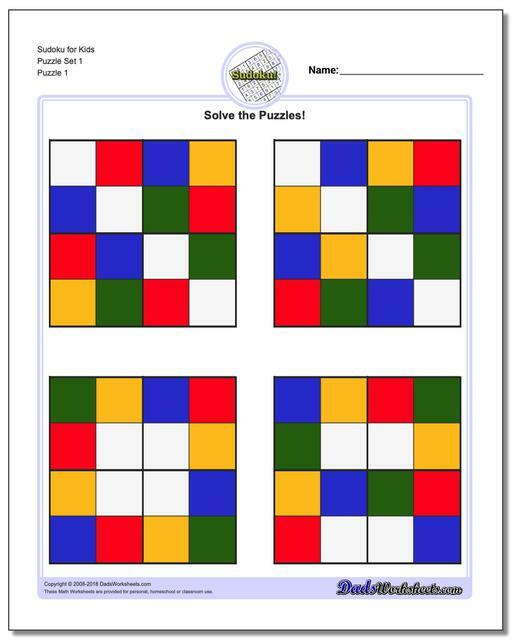 These 4x4 logic puzzles use color instead of numbers to help kids build the strategies needed for harder soduku puzzles. 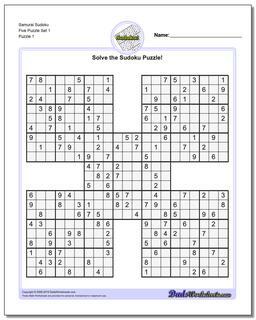 Sudoku is a type of logic puzzle that requires you to fill in digits on a 9x9 grid. The grid starts out with some positions populated and your job is to fill in the remainder. The numbers must meet certain criteria, specifically that the same digit cannot occur more than once in any column or more than once in any row. Additionally, you'll notice the sudoku grid is divided into 9 squares, each 3x3, and a digit can also only occur within these squares. These three constraints, that a digit not occur more than once in a row, column or square, make up the basic rules of sudoku. 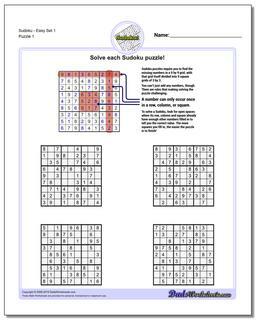 Suduko puzzles typically get more challenging depending on how many numbers are supplied in the initial puzzle. When there are many numbers supplied, it is easier to figure out which numbers can be put into a specific place in the puzzle. For example, if eight out of nine positions in a sudoku column already have a value, the nine position must contain the digit not already mentioned in the column. This same strategy of finding missing digits easily extends to rows or squares. Where sudoku puzzles get challenging is when there are multiple open positions in a row or column... In these cases you may need to look at more than one part of the puzzle to figure out how to solve the puzzle. Consider a row that is missing digits 5 and 6. If that's all the information you have, you have little to do except guess. However, you could look at the column that intersects one of the blank positions in the row. If that column already has a 5 in it, you know the value that goes in the blank position MUST be 6 because putting a 5 there would violate one of the sudoku rules. This sort of mutual exclusion is a powerful way to filter out possible values in your solution, and with a little practice you can apply it with rows, columns and squares. 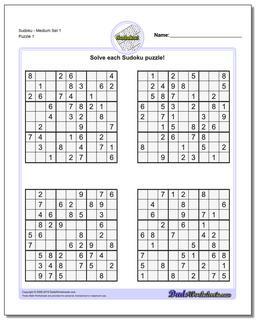 Sudoku puzzles, in spite of their Japanese sounding name, was originally developed for publication in French newspapers in the late 19th century as a variation of more common magic number puzzles. The puzzle was refined and took its modern form in the United States in the later part of the 20th century, and became a world-wide phenomena after computer generated Sudoku puzzles became common around 2004. 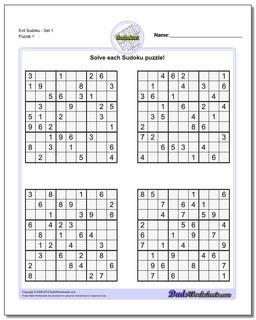 Sudoku puzzles explore an interesting area of math called combinatorics and there are various contemporary research papers written about the complexity and solvability of sudoko problems with different characteristics. It has been proved that a sudoku problem that has exactly one solution must contain at least 17 clues (although not all 17 clue puzzle boards will be a valid soduku or have unique solutions). The evil sudoku puzzle page here at DadsWorksheets.com contains a number of these 17 clue puzzles when you're ready for them! Given the popularity of sudoku puzzles and the rise in computer algorithms for generating and solving sudokus, it is no surprise that many variations have arisen beyond. 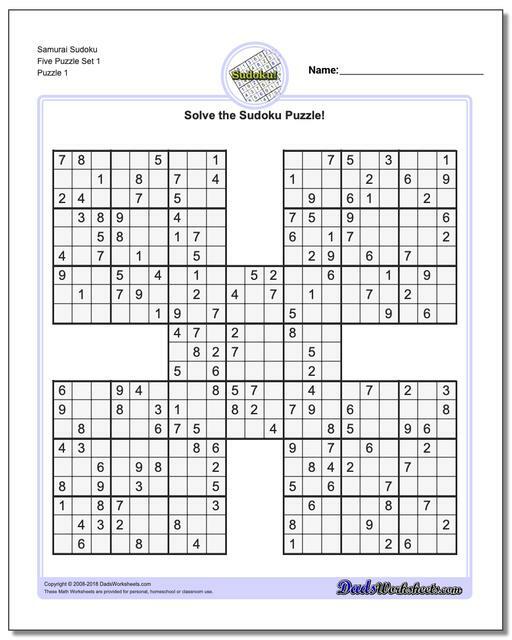 The Samurai Sudoku puzzles on this page are one variation where multiple 9x9 sudoku grids are joined together to form a larger puzzle. In terms of difficulty, these puzzles individually are not harder than the traditional sudoku puzzles that form them, but solving the larger puzzle grid is definitely a larger undertaking and many of them are beautiful. For younger puzzle players, the sudoku for kids section has a 4x4 variation on the sudoku problem that will build the same puzzle solving skills necessary for solving adult sized sudoku puzzles later. Introduce your kids to these, then move on to the easy sudoku puzzle pages and they'll be just as excited about sudoku as you are!